Six Wabash College students have accepted postgraduate fellowships to serve as English Teaching Assistants (ETA) in Austria, Germany, Spain, Paraguay, and Mexico. In all, 34 Wabash men have earned international fellowships in the last five years. Joey Dierdorf ’18, Taylor King ’18 and Aren Peterson '16 each received a Fulbright ETA award to Germany as well as a United States Teaching Assistantship (USTA) award to Austria. Dierdorf and Peterson elected to accept the Fulbright, while King selected the USTA award. Marcus Hoekstra ’18 won a Fulbright ETA award to Spain, Immanuel Mitchell-Sodipe ’18 claimed a Fulbright ETA to Paraguay, and Michael Lumpkin '18 earned one to teach in Mexico. The Fulbright and USTA programs are similar in their goals to place recipients in a classroom abroad to provide assistance to teachers of English to non-native English speakers, while serving as a U.S. cultural ambassador. It is the job of these native English speakers as teaching assistants to make learning a foreign language a lively cross-cultural encounter for their students. The age and academic level of classroom students varies by country, ranging from kindergarten to university. A double major in studio art and political science with a minor in German, Dierdorf was a member of the Glee Club for four years, an award-winning editorial cartoonist for The Bachelor, and active with the German Club, Sons of Wabash, Alpha Phi Omega, and Phi Kappa Psi fraternity. He took immersion trips to Tübingen, Germany, and London, England, and studied abroad in Vienna, Austria. Dierdorf’s lifelong interest in Scouting has fostered a commitment for environmental stewardship. His interest and enthusiasm in a myriad of subjects should help when relating to students. Hoekstra, a religion major with minors in Spanish and music, served as President of Model U.N., taught English as a second language to local youth while abroad in Spain, was involved in student government as a senator, served as a mentor for College Mentors for Kids, performed in the College’s Jazz Band, and is a member of Beta Theta Pi fraternity. Previously, he’s taken immersion trips to Israel and Palestine and studied abroad in Valencia, Spain, in the Spring semester of 2017. He will be based in Madrid during his Fulbright. As an aspiring diplomat hoping to work in conflict resolution, Hoekstra’s willingness to connect should serve him well, once again, overseas. King , a double major in religion and German, worked as an Admissions Office tour guide, interned at the Wabash Center for Teaching and Learning in Theology and Religion, sang in the Glee Club, participated in College Mentors for Kids and Alpha Phi Omega, and is a member of Phi Gamma Delta fraternity. He’s been abroad to Tübingen, Germany, to Israel and Palestine, and spent the Spring 2017 semester in Vienna, Austria, and Marburg, Germany. King will serve as an ETA at the Bundesgymnasium in Klosterneuburg, Austria, and plans to live in Vienna and take master’s courses at the University of Vienna while there. In order to accept the USTA fellowship, King has delayed entrance to the Princeton Theological Seminary until the Fall of 2019, where he will pursue an M.Div. degree. Peterson, a double major in German and studio art with a minor in biology, was active in the Biology Club, and the Society for the Furthering of the Liberal Arts. With the assistance of a Dill Grant, he traveled to Luxembourg to do epilepsy research in the summer of 2014, and went on the German immersion trip to Tübingen, as well, staying after in Freiburg to further study German via the Rudolf Family grant. Following graduation in 2016, Peterson served with AmeriCorps in Monterey, California, and worked with the Cahaba Environmental Center in Montevallo, Alabama. Peterson has delayed coursework towards dental school to participate, and will be based in Bayern, Germany, while part of the Fulbright program. 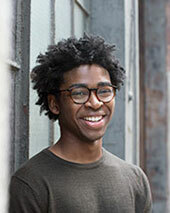 A philosophy major with a minor in political science, Mitchell-Sodipe was a member of the Malcolm X Institute of Black Studies, where he served on the senior and membership committees, and was affiliated with the Organization for Workers Liberation (formerly the College Democratic Socialists). He is a Gilman Scholarship award winner who studied abroad in Costa Rica, Guatemala, and Nicaragua during the Fall 2016 semester. Immanuel-Sodipe will serve as an ETA at the Universidad Nacional de Asunción in San Lorenzo, Paraguay, working out of the Thomas Edison Corner which is affiliated with the Instiutio Politecnica. Lumpkin, a political science major with minors in Spanish and economics, was a three-year member of the Wabash Democracy and Public Discourse initiative (WDPD), including the last two as a Senior Fellow, and served as President of the Wabash Dance Marathon, and is a member of Beta Theta Pi fraternity. Previously, he studied abroad in Valencia, Spain, in the Spring semester of 2017. While in Mexico, he will teach at the university level in Tenango de Doria. In order to accept the Fulbright fellowship, Lumpkin has delayed entrance to the University of Georgia until the Fall of 2019, where he will pursue a law degree. The Fulbright U.S. Student Program is the largest U.S. exchange program, offering opportunities for students and young professionals to undertake international graduate study, advanced research, university teaching, and primary and secondary scho ol teaching worldwide. The program awards approximately 1,900 grants annually and operates in more than 140 countries worldwide. Under the direction of the Austrian Federal Ministry of Education, the USTA goal is to bring talented and enthusiastic young people from abroad into the classrooms of secondary schools in communities throughout Austria. Since 1962, more than 2,900 college graduates from the United States have been placed in Austrian secondary schools as teaching assistants. Over the last five years, 34 Wabash men have earned international fellowships. The list includes a Rhodes Scholar, 16 Fulbright recipients, 10 Gilman Scholarship recipients, five USTA fellowship recipients, a TAPIF English Teaching Assistant (France), and a Cultural Ambassadors North American Language and Culture Assistantship in Spain. In 2017-18 alone, 14 Fulbright applications led to seven semifinalists, while four USTA applications led to three awards. Max Earp-Thomas ’17 is also a Fulbright ETA alternate for Taiwan.